A fabulous recipe that finds its way to a fat free feast!…This gently flavoured variant of sambar made with tender, deep green ridge gourd feels at home when served with steamed rice or rotis. Huli Thove and its twin “Majjige Huli” are proven partners in South Karnataka feasts.High in fiber, low in saturated fat, rich in minerals, poor in cholesterol, Ridge Gourd and its juice is nature’s prescription to heal jaundice, cure acne, cool any burning experience associated with urine, combat acidity, contain sugar levels…and much more! Red chillies 5 or 6 nos. 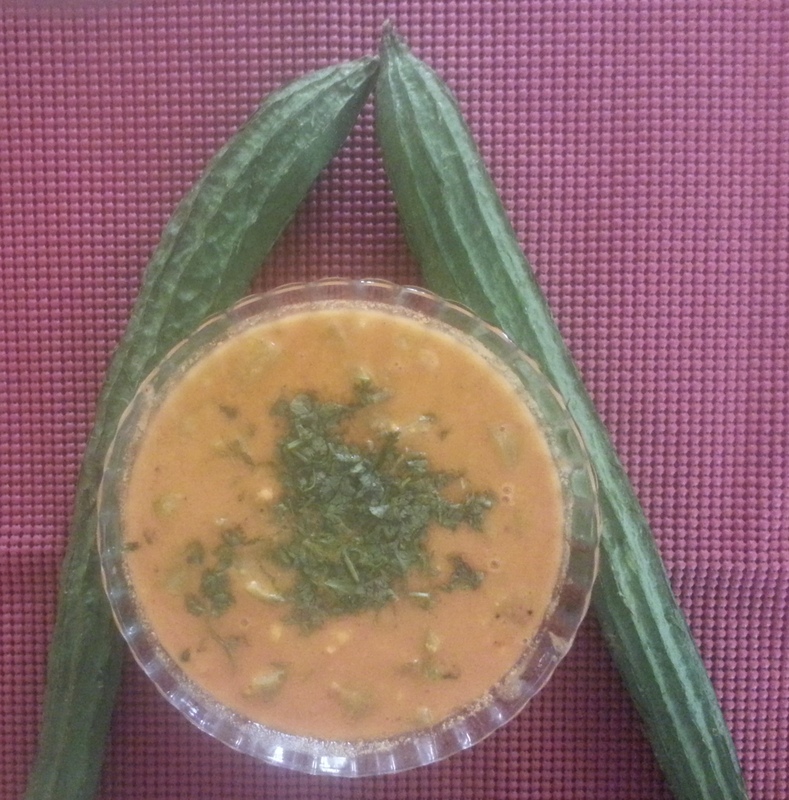 Wash ridge gourd, tomatoes, curry leaves and coriander leaves in salt water. Drain and keep aside. Cook dhal in a pressure cooker along with water, tomatoes, turmeric powder and a dash of ghee. While it is cooling …. Dhal would have got cooked, pressure in the cooker would have subsided. Vegetables would have boiled. Mix them together and let it boil for 5 to 10 min. Grind the dry fried ingredients (except dry coconut). Now add dry coconut and grind. Now add cooked tomatoes (and just a little quantity of water if required) and continue grinding to a smooth consistency. Add this ground mixture to the boiling dhal and vegetables. Also add ½ tsp of salt. Continue boiling for another 5 to 10 min. By now, you can feel the “Ah, wow” smell! For this, heat ghee in a small skillet. Put mustard seeds. When they crackle put broken red chillies and switch off the flame. Add asafoetida. Immediately pour it on to the boiling huli thove. Ridge Gourd Huli Thove is now ready. To make and store “Huli Thove Powder” for later use, dry fry and grind all ingredients listed under “Ingredients – For grinding” except cooked tomatoes.